There are many ways you can dress up your porch that don’t involve a lot of time and expense. Giving your porch a facelift can also extend your living space. Something as simple as a fresh coat of paint and a few well-placed hanging baskets with colorful flowers can do wonders, and perhaps give your home a whole new look. Use your decorating style to get the most out of your exterior space with cozy. Below are some suggestions to get you started. Flowers and plants add natural beauty to your porch and provide a sense of privacy. Place pots or hanging baskets of flowers on your porch. You can decide on a color scheme that complements your home’s exterior, or you can choose an assortment of your favorite flowers and plants. Put potted plants on an étagère or a festive outdoor table if your porch cannot accommodate hanging baskets. Use flowers and potted plants to fill in empty or hard to reach spaces, such as the corner of the porch where nothing else will fit. Or, try placing a tall potted plant between two chairs if there isn’t enough space to accommodate a small table. Arrange small pots of flowers on the edges of each step if you have stairs leading up to the porch. Your porch steps should be at least wide so that the pots don’t interfere with foot traffic. A large porch is ideal for seating arrangements, but even if your porch is small, you may be able to add a few small pieces of furniture that will make your porch look more inviting. If you live in a temperate climate and can add some seating arrangements to your porch, you’ll be able to relax on your porch and enjoy mild breezes all year round. Consider balance and scale when you are choosing pieces of furniture to put on your porch. Even if your porch is very large, you should arrange your furniture proportionally. You can use masking tape or painter’s tape to mark off the spaces for the furniture you have in mind. That way, you’ll know if the pieces you have in mind will fit comfortably on your porch and whether or not your arrangement as a whole will look balanced. 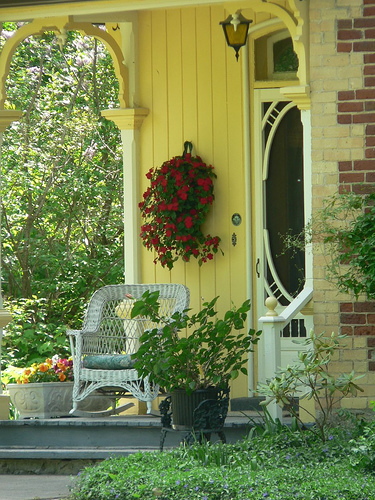 Try placing a small chair or table on either side of your front door. While it is ideal for your decorative touches to have functionality as well as appeal, placing small pieces on either side of your main entrance is very welcoming. Situate two small love seats or two chairs at an angle or across from each other to create a space for casual or intimate conversation. This seating arrangement is far more inviting than having all your seating facing in one direction, such as towards the street. Add a small table lamp or wall sconce if your porch has an outdoor electrical outlet. Soft lighting creates a wonderful ambiance during the evening hours. Put a piece of lattice work on any side of your porch that faces the street or a neighbor. The lattice lets in light, but provides some shade and privacy. Nothing says brand new like a fresh coat of paint. If you also plan to spruce up your porch with colorful flower arrangements, consider choosing a neutral paint color that will be complementary to any other splashes of color you plan to add to your porch. Paint your porch floor with weatherproof, outdoor paint. Get as creative as you wish and use several colors and paint a geometric design. If you want your design to look more like a rug, paint “fringes” on each end of your design. Paint will also protect your floor from the elements, so it’s a good idea to paint your porch floor even if you plan to use rugs. Use a contrasting paint color to highlight the trim around your door or porch windows. Give your porch columns or railings a fresh coat of paint. An attractive welcome mat is always a good idea, but you don’t have to stop there. You can make your porch feel very cozy with the addition of flooring material. Use an outdoor rug that complements your furniture. A patterned rug with warm colors will give your porch a nice, homey touch. Choose a large area rug if your porch can accommodate one. Make sure it is slip-resistant and made for outdoor use. Put a rug or straw mat underneath a coffee table or end table. The outside walls of your porch can be utilized to complement your other decorating touches. You can put many of the same wall decorations on the outside of your walls as you do on the interior walls. Use the outside wall of your porch to hang mirrors. They will reflect light and scenery. Look for attractive, affordable artwork at flea markets to hang on your porch wall. Add a wall sconce on either side of your entry door. You don’t have to wire them if you don’t want to; just hang them so that no wires are exposed, or hang candle sconces. Drape curtains over the top of a porch window. You can get 2 curtain panels and drape them over a rod and let them hang loosely on either side of the window frame. Hang flowing curtains in the front or on 1 or more sides of your porch. You can use a curtain rod or a piece of copper tubing and attach the curtains with clips. Tie the curtains back on windy days or rearrange them throughout the day to filter the sun. Hang twinkling lights on your porch. They don’t have to necessarily be Christmas light; think of how outdoor restaurants use mood lighting in the evening to create a warm glow outdoors. You can do the same on your porch. Look for flowers and plants that can tolerate your climate. If you have a tight budget, you can scour tag sales and second-hand shops for your porch accessories. Determine how you would like to use your porch space before you begin decorating. Do you want to have a quiet place to read? Would you like to make your porch more inviting and accommodating for entertaining guests? This will give you ideas on what items to include in your redesign. Figure out how much money you want to budget for sprucing up your porch before you decide on the changes you have in mind. No matter what activities and uses you have in mind, if your porch faces the street, you will probably want to add decorative touches that also provide some privacy. Choose potted plants that are over 3’ high, or plants that will grow to that height so that the plants can help establish some privacy. If you use a rug or curtains on your porch, be sure they are water and mold resistant. Keep in mind that some furniture and accessories cannot stay outside in cold weather. Whatever you put on your porch in the warm months may have to be brought indoors in the winter. Make sure you have enough storage space inside your home, basement or garage to overwinter delicate items.